Here is an enlargement of the Street Scene. Then below it, is a further enlargement of the scene. These are large scans, so they may take awhile to load. Notice the prairie to the west. The tallest building is where the Lion's Club building is now. The building on the right is the former Mar-Lon. The main street in Bronaugh runs east and west and it is covered with gravel. At one corner crossing, is a flagpole which flies the American flag and a Third Liberty Loan flag. The automobiles are parked in the middle of the street. On either side of this street are ten brick buildings; eight of them are on the south side and the remaining two are on the north side. One of the buildings is two stories high - the highest building in town. There are also along this street, fifteen frame buildings, seven are on the south side and the remaining number are on the north side. 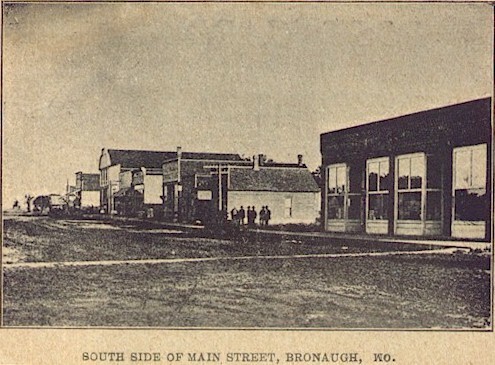 On the south side of the street are two Grocery Stores, Printing Office, Bank, Barbershop, Storage room, Drug Store, Garage, Poultry House, Post Office, Central Office and Grain Office. 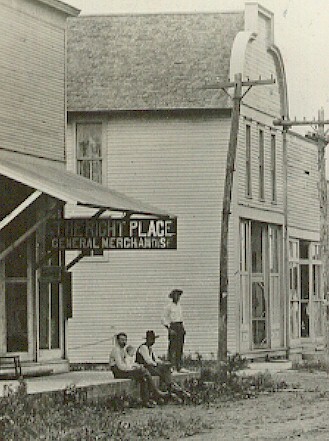 On the north side are two Grocery stores, Barbershop, Blacksmith shop, Carpenter shop, hotel, Bank, hardware, Lumberyard, Hay, Grain and Seed House and the Stockyards. The railroad crosses the street at the west end. Article from the Dicy Feller Noel Estate thanks to RayDean Shaw. 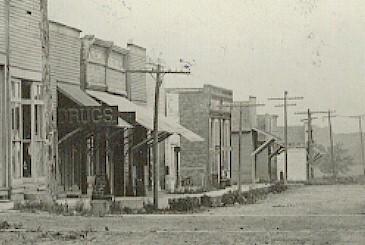 Here's a later view of Main Street. The photos below will help to visualize the west end of Main Street. Bronaugh Prairies provided lots of hay that could be shipped. This steam rig was photographed on the west part of Main Street, not far from the train tracks. 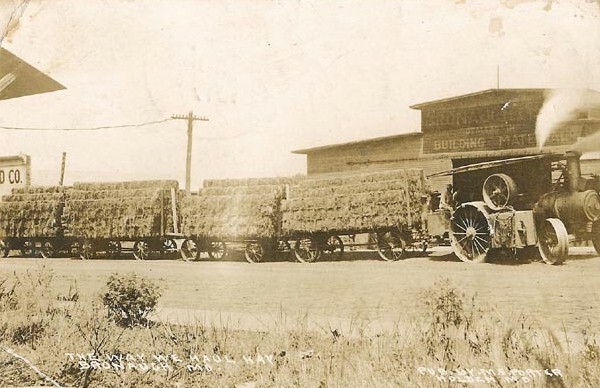 Here is another view of the hay wagons from the Ott Saathoff collection. 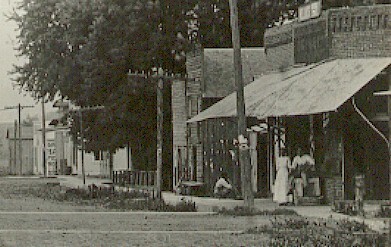 This is part of the photo taken from the south side of the west end of Main Street. 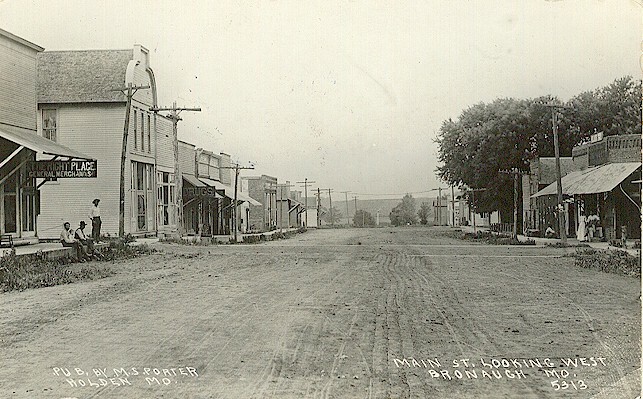 If you compare it to the above two photos, you can get an idea of what that end of the street looked like before 1920. To see the child in the photo go to the Fall Festival Page. Photo from Marjorie Range.